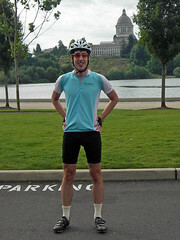 Me at the Capitol Building in Olympia, Washington. This was approximately mile 140 of the 170 mile bicycle ride, which I did in two days. I had a lovely time, minus the downpour at the end. I stuck with (drafted off of) a couple of Seattle Bicycle Club members this time, which I suppose made it a bit easier. Hitomi was off in Portland, Oregon riding the Portland Century.